If you are planning a trip to Korea for the first time, you should definitely go to Seoul. A city that truly never sleeps. You could shop, eat, drink and party around the clock. You could easily have 4-5 meals a day as well as snacks and street food if you can handle it. 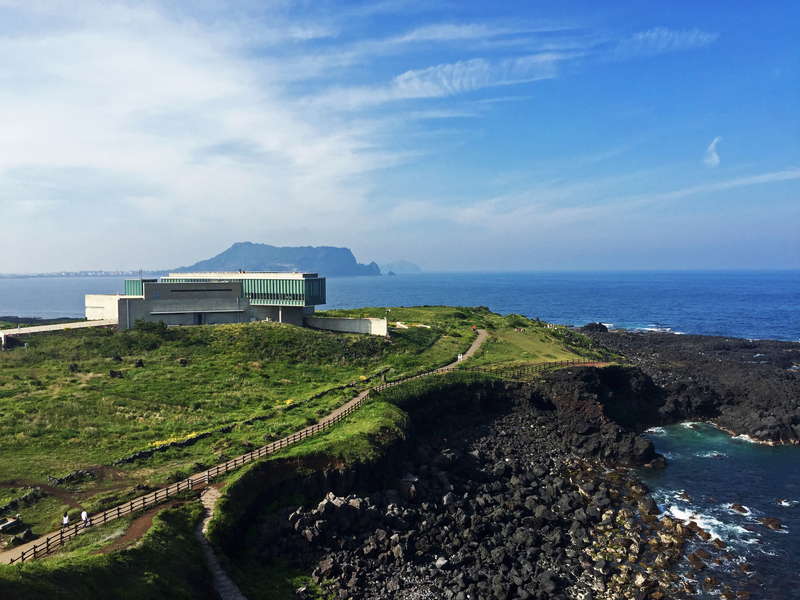 But if you have been to Seoul and looking for some peace and quiet away from the hectic city, Jeju island (Jejudo in Korean) is the place for you. Jejudo is a volcanic island dominated by Hallasan (shield volcano and the highest mountain in South Korea). 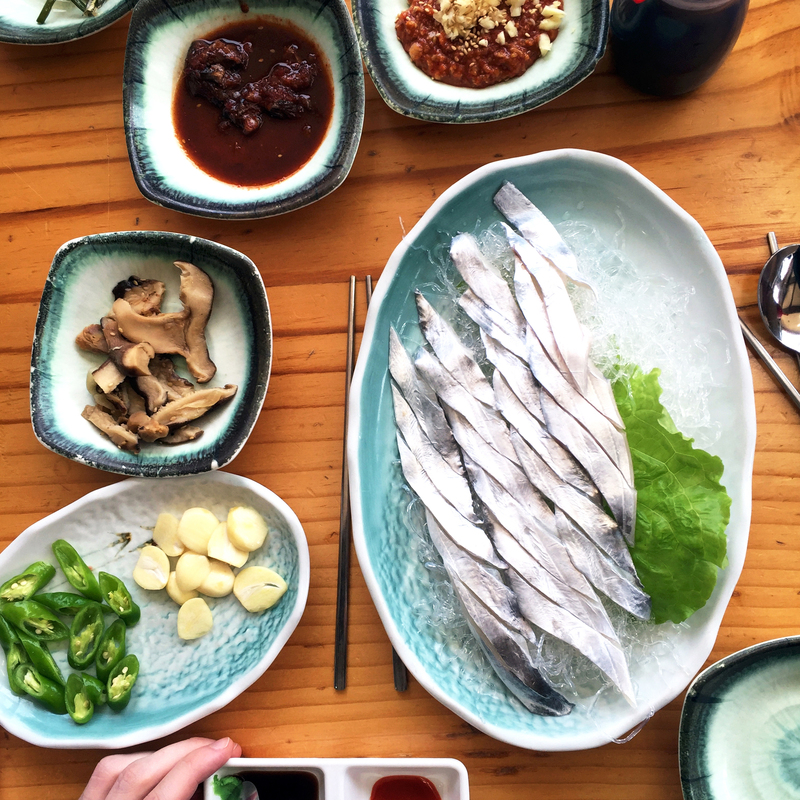 There is no place like Jeju island in Korea in terms of natural beauty, clean air and more importantly the food. This was my second time visiting and I fell in love with it all over again. 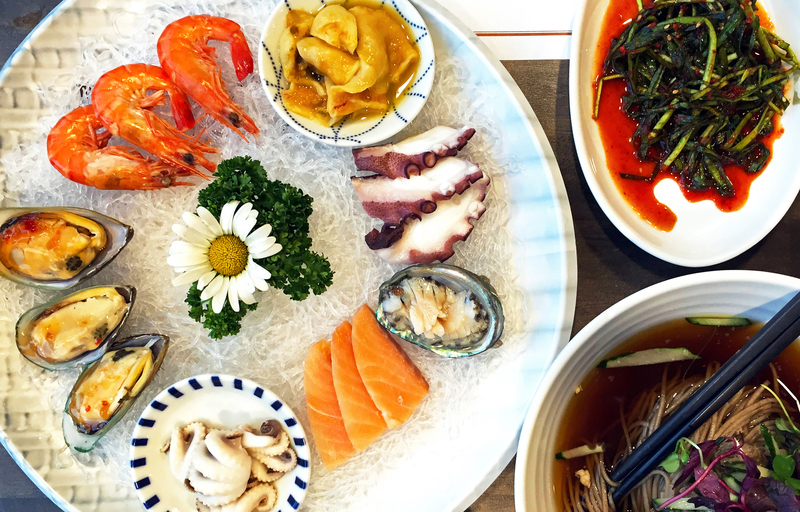 Jeju is a heaven for a seafood lover like me. 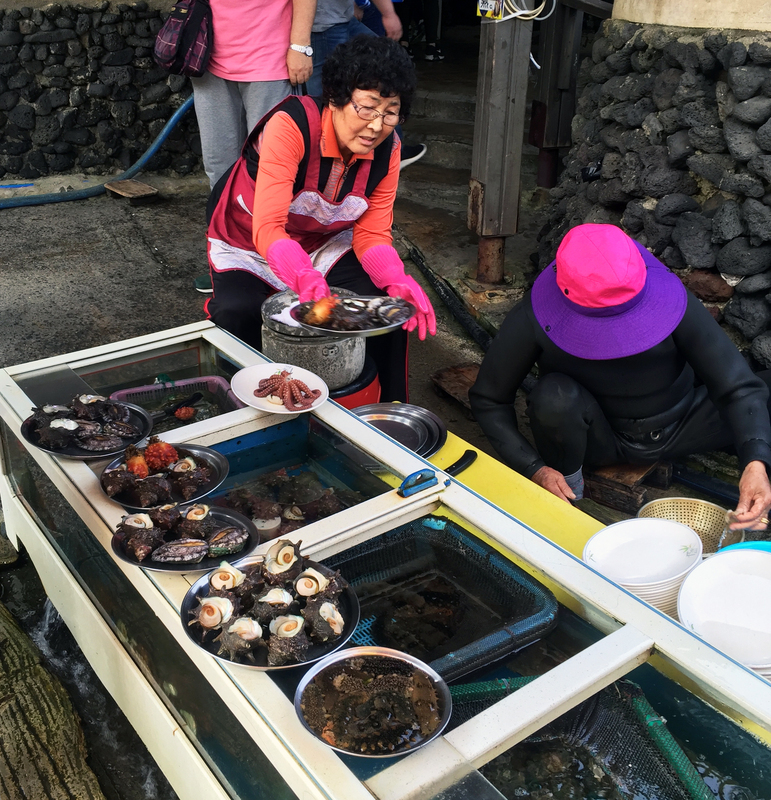 Being the largest island off the southern cost of Korea, Jeju has an incredible variety of seafood including ones that are only available in the region. 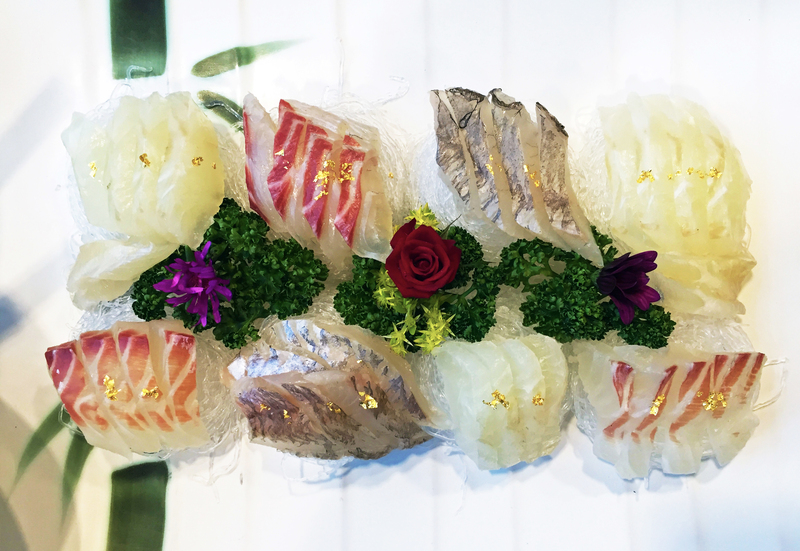 This hairtail sashimi is one of the best examples. According to our taxi driver, hairtail die immediately after they are caught and it makes it hard to eat raw outside Jeju. Hairtail always have been my favorite fish growing up either braised or grilled, but I was never able to have them outside Korea. And the last time I had the shashimi before this meal was 10 years ago. So it is not an exaggeration when I say that I spent days picturing and dreaming about this shinny silvery beauty. 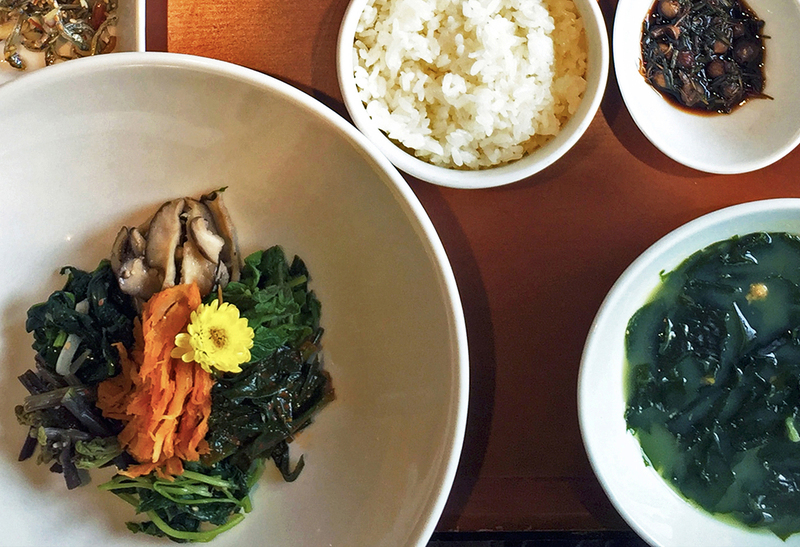 I have to say this is not one of the cheapest meals you could have in Jeju, but it is definitely a treat worth trying if you are in the island. When I thought things couldn’t get any better, I stumbled upon a place where I could have the freshest conch ever. 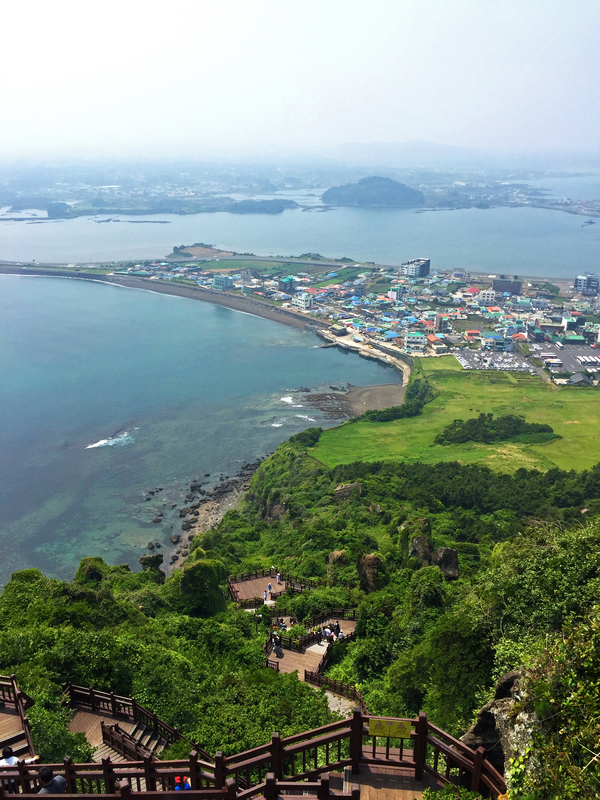 It was where my lazy parents were watching a performance by Jeju sea women ‘Haenyeo’, snacking on their latest harvest and day drinking Soju against gorgeous backdrop of Seongsan Ilchulbong (meaning sunrise peak), while I was sweating and climbing all the way up to the top of it. Although I missed the performance I made it down for conchs that were just caught by the sea women. It just couldn’t get any fresher than that. I wish I had more and better photos to describe my favorite meal in Jeju than what I have above. It was an enormous course meal of 15 beautifully presented small and big dishes that are prepared in local style. 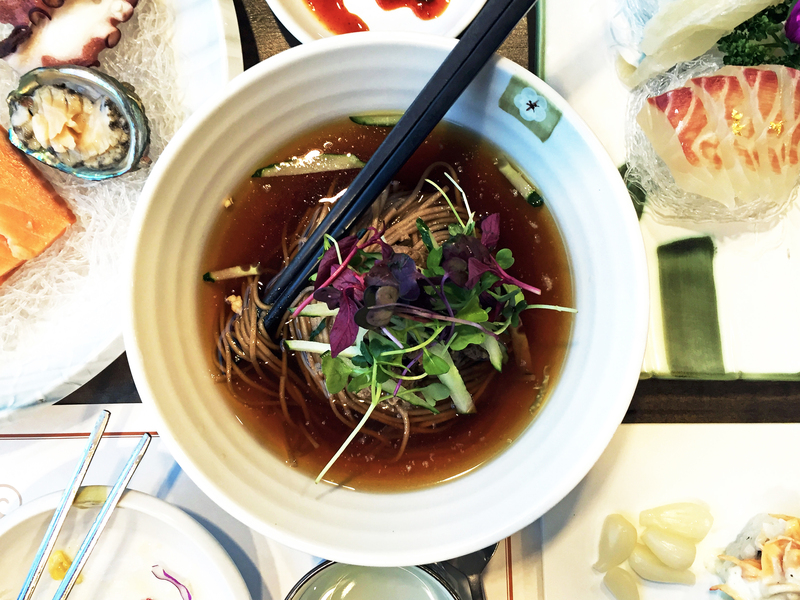 The meal was well balanced with soup, porridge, multi-grain rice, soba noodles, meat, seafood, herbs, pickled and fresh vegetables. 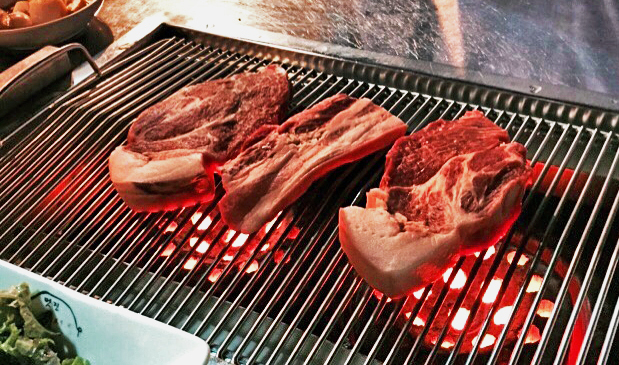 Gosh…my mouth is watering just thinking about it again. Honestly, the food just kept coming it was so hard to keep track or to take pictures of them. Good thing this restaurant is only minutes away from Halla Arboretum, so you could walk off the huge dinner. If I were to pick my favorite meal based on the atmosphere, I would go with a dinner I had at Mint. It is a restaurant inside the glass house designed by Tadao Ando on stunning Seopjikoji heel in the photo above. You can imagine how breathtaking the view must be when you are sitting behind this full height glass facade. 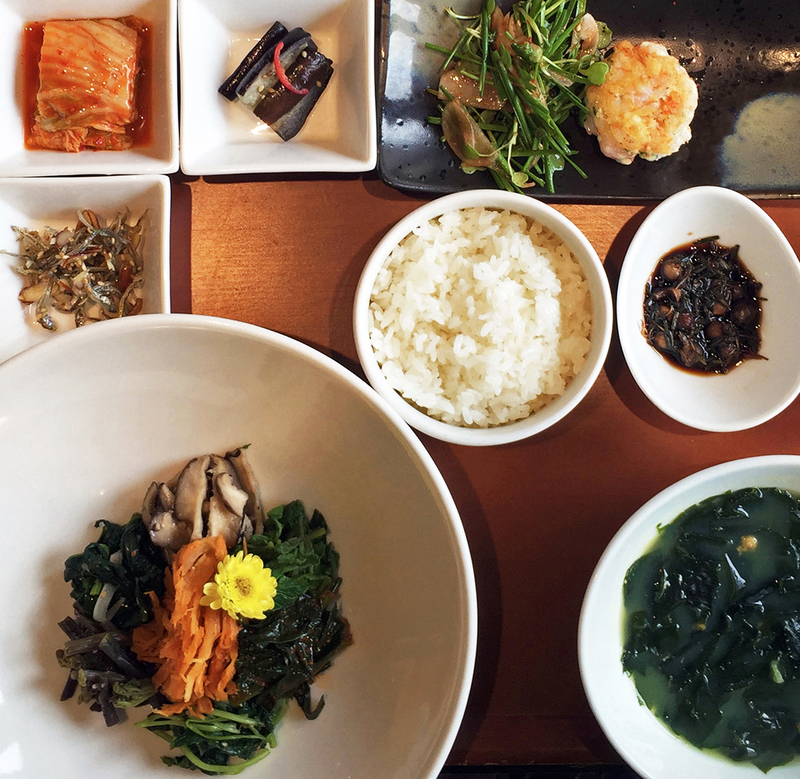 Their food is also delicious, it is presented in western style but made with local ingredients so it still has the essence of Korean/Jeju flavors. All of this looks so amazing, Jin! Thanks Eli 😉 they really were amazing! Thank you so much. 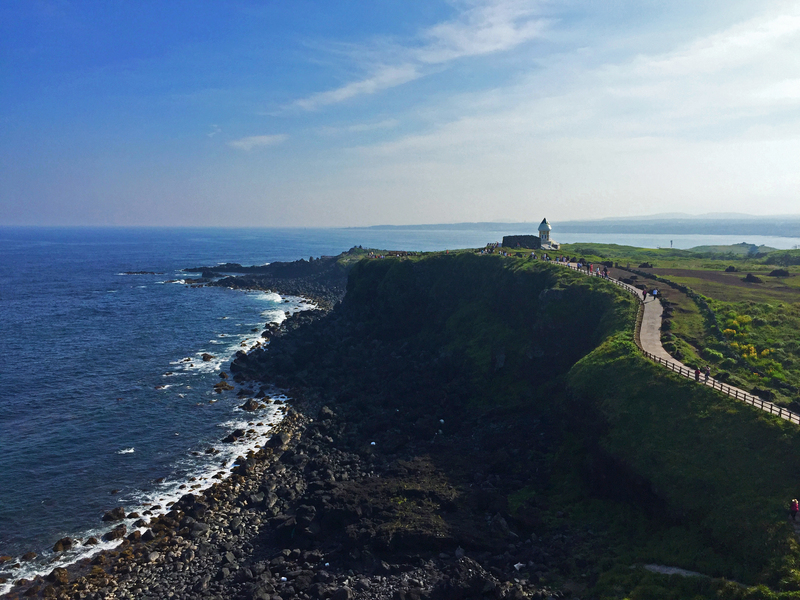 I am already missing Jeju a lot! That’s exactly what I wanted, so happy that you enjoyed 🙂 Thanks dear.